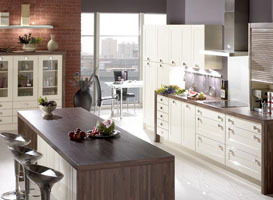 Thomas Kitchens & Bedrooms have been established for over 25 years in the Nuneaton area. We are proud to offer a wide range of quality kitchens and bedrooms at competitive prices! All of our ranges and appliances are carefully selected to enhance the overall look of your new kitchen and reflect the quality of your new kitchen cabinets, whether traditional or contemporary. We are authorised dealers for Sheraton, Omega, Crown and intuition and supply which ever brand suites you best! Thomas Kitchens and Bedrooms are proud of the service we provide and would welcome both new and existing customers at our showroom to discuss your requirements. For further information regarding products and services please feel free to contact us on 02476 642361 for a FREE no obligation quote.